For more than 90 days, oil gushed into the Gulf of Mexico before the leak was finally "capped" in late July. It is estimated that approximately 4.9 million barrels (or 205.8 million gallons) of oil spilled into the waters. It has been one of the biggest environmental disasters in decades. Hundreds of miles of beaches, wetlands, and estuaries along the northern Gulf Coast have been impacted. The spill, though temporarily "capped", continues to cause extensive damage to marine and wildlife habitats as well as the Gulf's fishing and tourism industries. Families are without work and marine and land animals continue to suffer. And there are still many unknowns about the long term effects of the oil and of chemical disbursements used in attempts to curtail the flow and impact upon the regional coastline and waters. 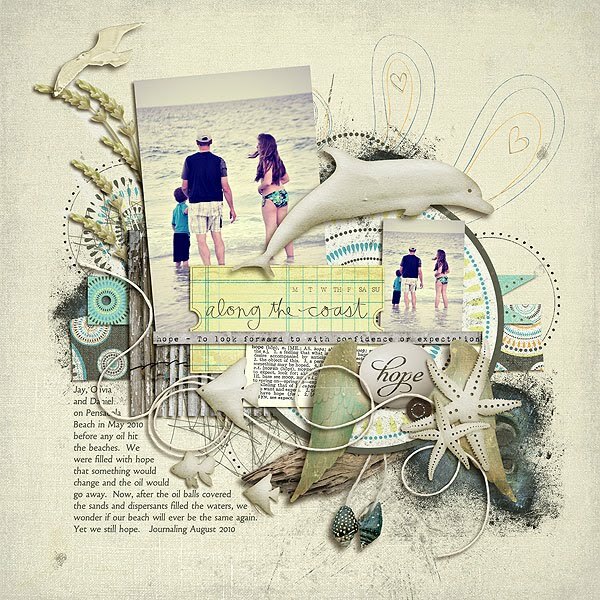 Forty-five designers across the digital scrapbooking community have united with one shared cause: to raise awareness and to support recovery efforts for the environment and those impacted by this tragic disaster. Participating designers include: Aja Abney, Amy Martin, Biograffiti, Boutique Cute Dolls, Createwings Designs, Deena Rutter, Designs by Cindy Schneider, Designs by Crystal Livesay, Dido Designs, Dunia Designs, Emily Merritt Designs, Fiddle-Dee-Dee Designs (that's me! ), Fizzy Pop Designs, FruitLoOp Sally Designs, Laurie Ann (Heaven's Gate Designs), Holliewood Studios, Holly Designs, Holly Spring Designs, Jazzmin Designs, Jennifer Barrette Designs, Jacque Larsen, Juliana Kneipp Designs, Kay Miller Designs, Kaye Winiecki, Kitty Designs, Kristin Aagard Designs, Lauren Grier, Leora Sanford, Loreta Labarca, Micheline Martin, Nikki Beaudreau, Paislee Press, One Little Bird Designs, Sabrina Dupre, Sahlin Studio, Sarah Cornish of My 4 Hens Photography, Shabby Miss Jenn, Studio Basic Designs, Sugarplum Paperie, Tickled Pink Studios, Tiny Toes Designs, Tracie Stroud, Vera Lim, Vinnie Pearce, and zinnias and swallowtails. Hands Across the Gulf is our heartsong for this cause. 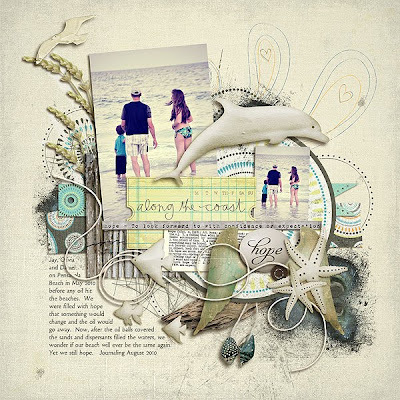 This gorgeous kit representing the varied styles of the scrapping community, is positively overflowing with beautiful papers, unique elements, templates and Photoshop actions. All told, designers have contributed more than 100 papers and 200 elements, 2 full alphas, 18 templates, and 4 PS actions to Hands Across the Gulf. Available for sale for one month only, 100% of the proceeds from this kit will be donated to the National Wildlife Federation and to the United Way's Gulf Recovery Fund. 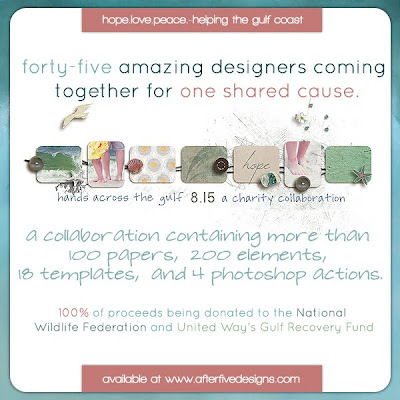 Hands Across the Gulf arrives Sunday 15 August 2010 at After Five Designs. Image is linked to the After Five Designs Shoppe.